I love simple recipes. I love potatoes. This recipe is the perfect marriage of both. Can I get an amen, friends? Looking for an ultra-simple, yet ultra-tasty side dish? I've got you covered with this rockin' recipe. And, you'll love the short, no-nonsense ingredient list. I've always roasted potatoes in the oven. I recently set out to attempt to achieve the same result as oven-roasting except that I wanted to cut the time way down and I wanted not to have to heat up my oven. This couldn't-be-simpler recipe is the end result of my recent experimentation. First, I think you'll enjoy how short and simple the ingredient list is for this dish. 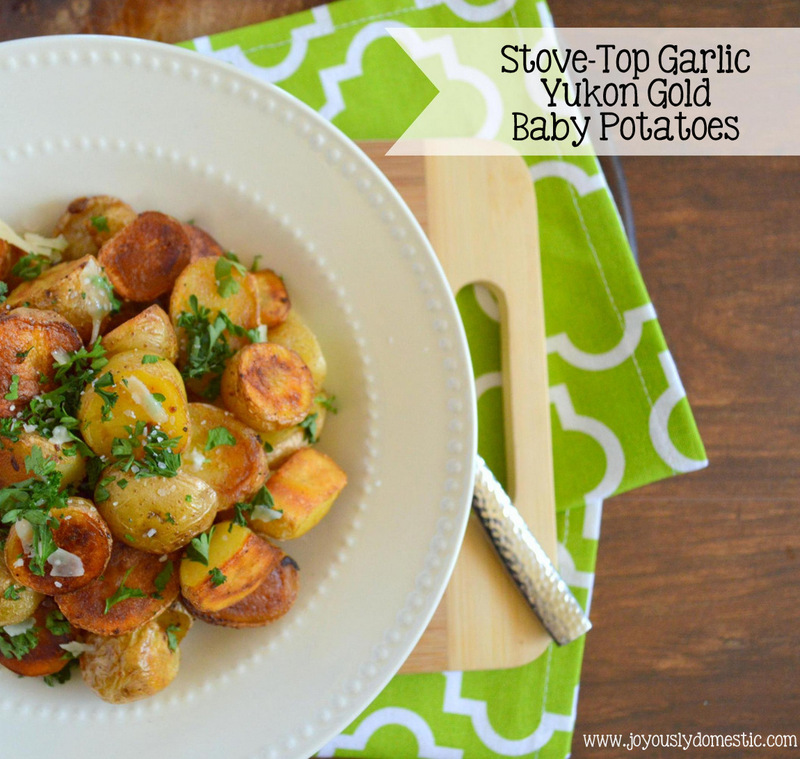 Basically, you need just three ingredients - olive oil, baby potatoes and garlic. (Of course, I consider salt and pepper as "freebies.") If you'd like, you can garnish the cooked potatoes with fresh parsley or snipped chives at time of service. And, just for fun, I sprinkled on a little freshly-shaved Parmesan. These are great served as-is or you can serve them with a sour cream and chive dipping sauce. Of course, my kids seem to enjoy them with ketchup. A creamy ranch-style dressing is, also, good with these. Heat a large skillet over medium-high heat. Add the olive oil. Allow oil to heat up for two minutes. Add the potatoes into the hot oil. In the last 1 - 2 minutes, sprinkle in the minced/grated garlic. Stir to coat potatoes with garlic, but do not allow garlic to burn. (Lower heat if necessary.) Check and adjust seasoning, as needed. Remove from heat and transfer potatoes to a serving dish. Garnish with fresh parsley or fresh chives, if desired. Sprinkle on freshly-shaved Parmesan at time of serving, if desired. Lovely combination of flavors here.It was delicious, I love an explosion of flavors.